If you are interested in experience reports of Management 3.0 practices, you probably already read a lot about Kudo Cards, Moving Motivators and Delegation Poker. I also shared my experiences with those practices. In this experience report, I would like to share my experiences with the Team Competence Matrix. Jurgen Appelo does not describe it in one of his books. The Team Competence Matrix (TCM) is an “official” Management 3.0 practice and was developed by Christof Braun. The TCM is a perfect tool to give a team, or organization insight into the skills they have, and/or need. You can use the practice when you talk about competence development in general, but also when you ask teams to completely organize and set them up themselves. Self-organization is not just a blank page to do whatever you want. TCM can help you as an organization to give team members some constraints and guidelines on how to organize themselves. It can give you insight as a team, what are your strengths and weaknesses. If you set up a workshop where teams are going to organize themselves, you can use it as guidelines. You can describe upfront which skills you need in the teams, and people can use the TCM as a tool to check if the teams are set up correctly. In the end, it should be a conversation starter! Before I dive into the TCM itself, let me provide extra information. I am going to explain skills and skill levels. To set up a TCM, you first need to make an overview of the skills you need for a project. So, let’s assume we are going to set up a TCM for a project that will last a long time. What kind of skills do you need? Technical skills, depending on your domain it could be how SEO works, or how to make a cup of coffee, or how to develop a microservice. Besides technical skills, you probably also need soft skills. How important is it to communicate with stakeholders, customers, and other teams? Another competence area could be subject matter expertise. Do you need to have in-depth knowledge of taxes, coffee, financial systems, etc? The discussion to decide which skills you need can already be very valuable in my experience. By choosing on the skills, all assumptions are on the table and discussed. How many skills should you define for your project? I don’t know… but 100 sounds like a bit too much, doesn’t it? I would say, keep it to a maximum of 15 skills and otherwise split the TCM into a TCM for soft skills and another TCM for technical skills. After identifying the competence areas, you need to agree on the skill levels. What kind of levels are you going to use to indicate which level someone has in a certain competence area? Here are the different models you can use. Shu: In this beginning stage, the student follows the teachings of one master precisely. Ha: At this point, the student begins to branch out. Ri: Now the student isn’t learning from other people but from his own practice. A second model is the one that Christof Braun describes in his practice and they are called: Apprentice, Journeyman, and Master. Based on the guild system of Western Europe in medieval times. Expert: I can teach it. Practitioner: I can do it. Also, assign colors to different levels. Be careful which colors. You could use red, orange and green. However, in my experience, people don’t like red. Red is negative. Maybe use colors like blue, yellow and pink. Think about it at least. Do you want to learn more about Management 3.0? Download my free book about Management 3.0!! You get the point. Now, why not ten levels, or perhaps even sublevels? Well, keep it simple, In the end, it is all about the discussion and creating awareness. Introducing ten knowledge levels doesn’t help. The focus will be on determining the specific levels, instead of the actual interaction. The first step to create a TCM is to draw a grid. A row for every skill, and a top row for the names of your team members. Then add a column for every team member plus two extra columns. In the first column, you write down the skills. The second column is very important, it will contain the skill requirements you need. As an example, you are setting up a team for promoting your new product. 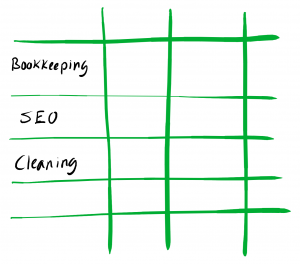 One of the important skills is SEO. You will need to think about how many experts (or Ri) people you need, how many practitioners (or Ha) and how many novices (Shu) people you need. We assume everyone is automatically a novice. If you really disagree with this starting point, and you believe there is also a difference between a novice and somebody having no knowledge, you could simply introduce one more level, something called noob or such. You just place a symbol for every skill level you defined and write down the number of people you would like to have at that skill level. It could be that a specific skill is so important, that all team members require that skill at the expert level. In that case, just write down the number of team members possessing the expert level after the green dot. Maybe you just need one expert, and the skill level of other people doesn’t matter. In that case, just write a 1 behind the green dot. Maybe you just need two novices and one practitioner. In that case, place the number 2 after the yellow dot and a 1 behind the orange dot. The total number of skills required doesn’t have to be equal to the number of team members. If you just need one master, that is OK. In that case, the skill level of the other team members doesn’t matter. Note that there are some interesting things you need to think about. For example, do you need to have back up for a skill? If so, what kind of skill level should the backup person possess? Do you really need 5 masters of a certain skill? The last and most interesting step is to completely fill in the TCM with the team. The first column specifies the skills, the second column specifies the required levels, and the other columns will represent your team members. The last step is that every team member fills in their skill level for a required skill. Basically, you are asking every team member to judge their skill level and make it explicit. Interesting right? Assuming you have a driving license, are you willing to state that you are a good driver? I think no one will say she or he is a bad driver. Still, when I commute by car, I always encounter some pretty terrible car drivers. How is this possible? I believe that if you have a company culture where people feel safe, to be honest, failure is not an issue. People will honestly fill in the matrix. I often add one “rule” though. You need to ask feedback from five other people. What do those people think about your skill levels? Basically, I ask my team members to convince/prove to me that they filled in the TCM correctly. I already used the TCM several times, and I will probably make one change next time. I will add one super expert level and one super novice level. The reason is simple. If you are a novice for a certain skill, you need to select the lowest level. Some people feel a bit uncomfortable doing that, so they naturally go for the mid-level. The expert level maybe is considered a bit arrogant by some so for some skills, people will again choose the mid-level. Therefore, I want to try my next TCM with five levels, where I consider the lowest and highest level just as buffers. Management 3.0 is all about experimenting, just try things out and learn. When all your team members have filled in the TCM, collected feedback, maybe made some changes, we are ready to analyze the TCM. It is very simple, and that is what makes the TCM so powerful in my opinion. The second column contains the skills you need. Just count the number of skills people filled in. If you need one master, but there are just seven practitioners, you have a problem. If you just need one master, and you have seven masters, you could have also a problem. Maybe another team could use one or two masters from your team. However, you will also need to check the other skills in that case. If you have a skill gap, you need to solve it, or not. You can solve it by helping team members to develop their skills, or by maybe hiring consultants, there are many solutions possible. However, there is one thing you need to take in consideration. If you need some skills and they are not on the team, you also need to ask your team members if they want to develop that skill. If, for example, you need a Cobol master in your team that only consists of millennial developers, you have a problem. I have the feeling already that there will be no team members who would like to develop their Cobol skills. 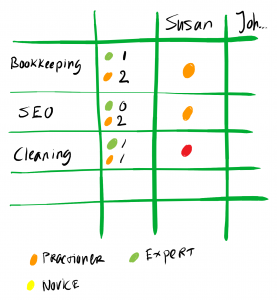 Did you use a Team Competence Matrix already? If so, what did you lean? 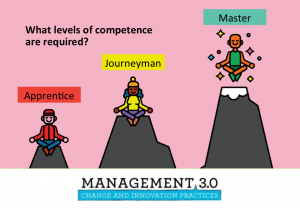 If you want to learn more about Develop Competence, attend a Management 3.0 Workshop. Learn how to create a system where people can develop themselves.